This is the beginning of my Easter basket sewing! They're perfect for fitting in Mae Bae's hand (she loves carrying little dolls around in her hand) and they're snuggly and soft! I can't wait to see her playing with them! These are adorable! (When I first read the post, I thought you said you had stuffed them with "rice and vodka"!!! 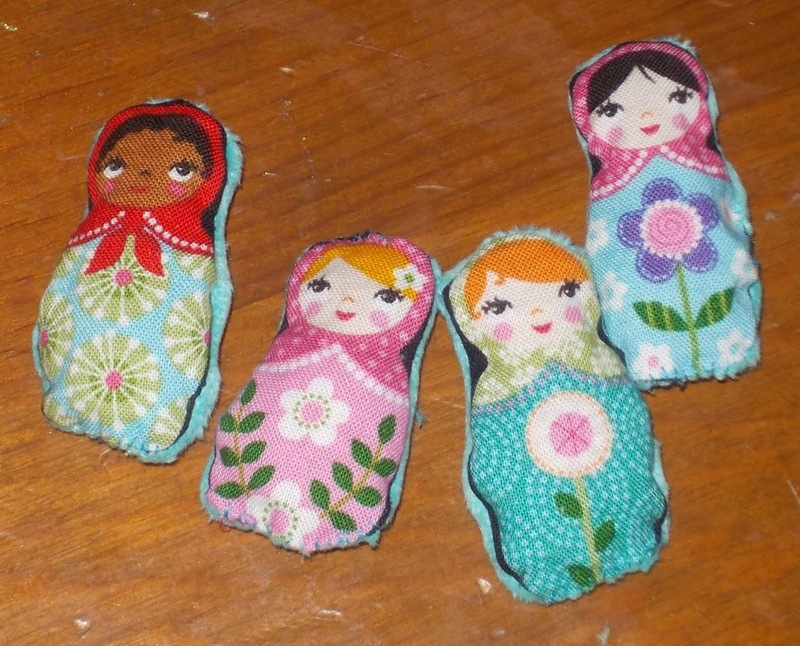 (That would have been perfectly appropriate, given they are Russian dolls! LOL!) Clearly, I need to change my contact lenses. Now all you need are some "pysanky" - those gorgeous painted Russian Easter eggs to put in their baskets. I was looking for a place to e-mail this question, but since it is sewing related, I figure I will just ask here! A while back, you made some cute dresses with ruffle fabric. I bought some the other day and then realized I have no idea what to do with it! I would say I have a moderate sewing ability, but haven't worked with stretchy fabric much. Can you tell me what you did for the girls' dresses? Thanks. The main trick I use when sewing stretchy fabric is sewing it slowly and not tugging at it too much so that it doesn't stretch as I'm sewing it (sometimes with stretch fabric that can make the edge look wavy). The hardest part with the ruffle fabric is making sure that the ruffles are laying flat when you sew them. One strategy is to pin them very carefully. I'd also suggest sewing with the fabric, so that all the ruffles are pointing towards you as you sew, so that the edges don't catch on the foot of your machine. On my next ruffle sewing adventure I am going to try french seams which basically means that I'll first sew the seam with the right sides facing out (so it looks like I'm sewing them inside out) I'll then watch to make sure that the ruffles stay lying flat, then flip the dress inside out and sew another seam far enough in that the first seam I sewed is enclosed. Then one last seam will tack down the enclosed seam that is now inside the dress. I'm hoping that that the french seam strategy will also help keep the ruffles in place while I'm sewing (and it makes the insides so nice and neat). You are so clever and creative! Those little dolls are adorably cute. I liked your description of french seams too. I should try that sometime soon! LOVE These!!! They're so adorable!!! Oh my goodness - LOVE LOVE LOVE! These are such a cute idea!!! You're so creative!